A little background: General Chaos Visuals is the Toronto, Canada based lightshow duo of Stephen Lindsey and Eric Siegerman, who provide psychedelic projections for concerts and other events. I know Steve and Eric from the Hawkwind lists and the Strange Daze Space Rock Festivals that Jim Lascko used to host in Cleveland, Ohio. URM is the solo electronic project of Jamie Todd, also based in Canada. I was previously unfamiliar with Todd's work but based on the music on this DVD I'll be checking out more of his music. The Luminations DVD is a 6-track audio-visual "album" collaboration between Lindsey and Todd. 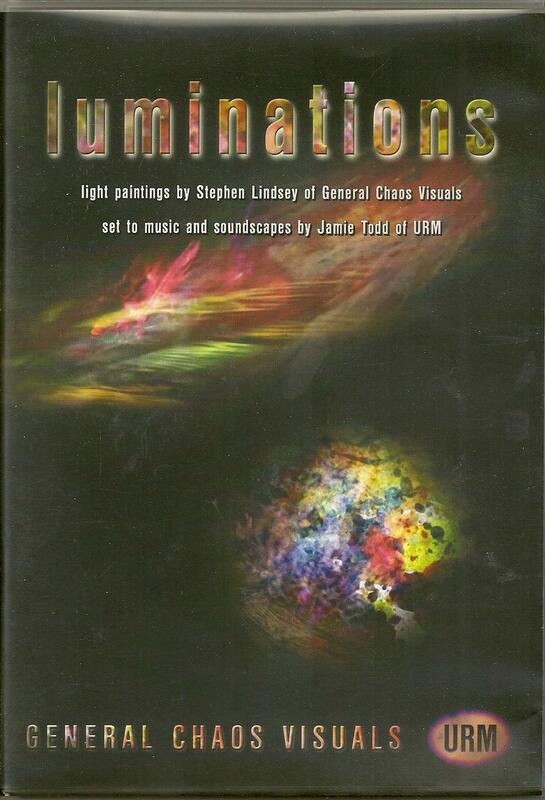 Lindsey created the images on the DVD by projecting light through translucent paintings. There is NO digitally created imagery in the film. I'll go further and quote from the description on the DVD box: "The techniques Stephen used for creating the imagery in this film primarily include the use of hand-painted transparent images which are kinetically rotated and overlaid with multiple projectors. The images are manipulated using optical analog techniques such as prisms, crystals and fingers." Sounds pretty cool, huh? It IS! Bedlam is the opening track and consists of spaced out electronica that combine soundscapes with lots of fun alien bleeps and blurps. It's got a powerful soundtrack quality that conjures up images of 1950s sci-fi flicks. And when the drums kick in it provides a rhythmic foundation, the result being a pretty cool groove that sounds like some kind of alien zombie dance. The music is set against a swirling colorful haze of visual eye candy. Lindsey keeps the visuals flowing in multiple directions, which is disorienting but still pleasant because it's all so seamless. Riteous features slowly developing electronic pulses against a prominent and sometimes disconcerting heartbeat effect. The movement of the visuals is similar to Bedlam, but there's a sense of being in a lysergic forest or wading through some intergalactic field, with leaves and other colorful debris slowly circling. Space Cowboys is one of my favorite musical pieces of the set, featuring sequenced electronic space rock that would appeal to fans of Phaedra/Rubicon era Tangerine Dream. The visuals have a more classic liquid lightshow look. The colors are beautiful and... I keep referring to the movement but I love the way the patterns flow, and do so in multiple directions at once. Foredoom consists of slowly oozing synths, soundscapes and drones. It's very trance inducing and really sets up the visuals on this track. The visuals look like a ferocious storm in space. At first there's very little in the way of color, giving it all a very spectral appearance, like ghostly apparitions in the cosmos. Colors do start to become more prominent, and when they do I see an image forming in the center of the screen. It keeps evolving so I couldn't quite put my figure on what it is, but at times I saw a face, a mutated body, internal organs, and all the while the grey storm is rushing by... I got really focused on this one. Bushwacked is strangely musical with a tribal feel. Visually this is like a continuation of Foredoom, with fascinating imagery constantly morphing in the center, surrounded by the kaleidoscope swirl. Percolate features more space rock electronica that is similar to the music on Space Cowboys. This might be the most visually busy track of the set. Part of it looks like Hubble telescope imagery, but there's also what looks like clusters of planets or sea sponges that keep popping up. A cosmic-aquatic blend perhaps. Really gorgeous and totally mind-bending stuff. Listening to the music while focusing on the visuals made for a delightfully immersive experience, and I thoroughly enjoyed writing impressions of both the music and visuals. I need to check out more of Jamie Todd's music.